The Source Africa trade show, held 10-11 June at the Cape Town International Convention Centre, showed off Africa capabilities as a sourcing destination. The event featured more than 200 textile, apparel and footwear exhibitors from South Africa, Mauritius, Lesotho, Swaziland, etc. This year’s show attracted approximately 1 500 visitors. 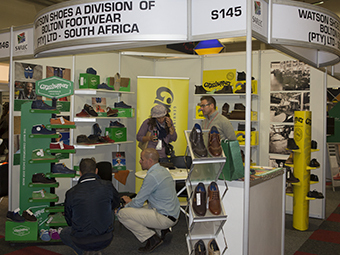 Source Africa featured more than 200 exhibitors 10-11 June. The show also featured three business seminars on topics Tools for Developing International Business, AGOA Renewal - The Next 10 Years and Regional Supply Chains. Jordan & Co.’s Jody Henry managed their stand on day one. 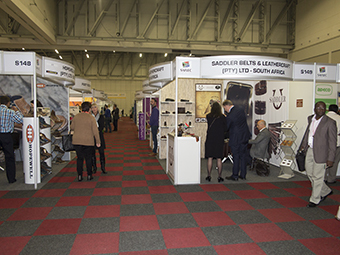 Well-known South African suppliers showed their products and services in the exhibition area. 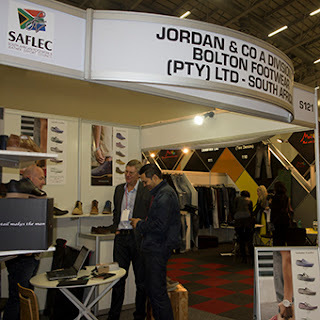 Bolton Footwear divisions – Jordan & Co., Barker and Watson Shoes – showed off each brand's new range introductions and promoted brand awareness. All three divisions were located in the same area, with Jordan & Co. on their own stand for the first time this year as they needed more space for their extensive ranges, said Jody Henry of Jordan & Co., who was manning the stand. 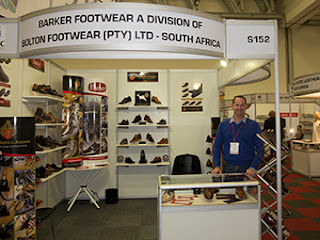 Gary Gilder on the Barker stand, which showed off their new Crockett & Jones range. Barker was exhibiting their new Crocket & Jones range, which is aimed at attracting the younger market. The brand, previously associated with older men, now has new styles that use fashionable lasts and more modern toe shapes. The aim for the show was create brand awareness and revitalise interest in the brand, said Gary Gilder. The Watson Shoes stand attracted quite a bit of traffic. The Watson Shoes stand was all about their Grasshopper brand. It showed their wide variety of styles (both old and new) and that they are about much more than just the well-known Grasshopper moccasin style. 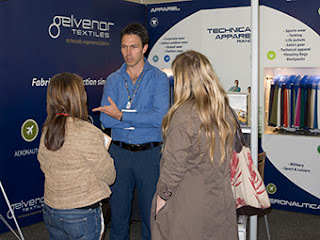 Gelvenor Textiles’ Sefton Fripp answered any questions visitors had about the brand. Gelvenor Textiles’ stand featured various materials they manufacture and showed off the diversity in their range. Their fabrics’ uses are endless and can be used to create clothing for use in hazardous work, outdoor, aeronautical, etc. environments. 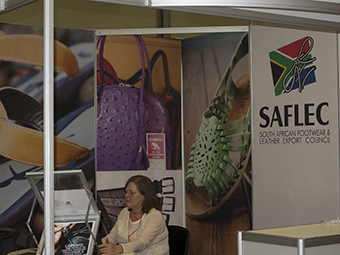 Louise Pelser was hard at work at the SAFLEC stand. 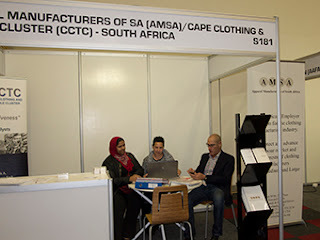 AMSA shared their stand with the Cape Clothing and Textile Cluster. The Apparel Manufacturers of South Africa shared a stand with the Cape Clothing & Textile Cluster to provide information on what they can do to assist local manufacturers. The Executive Director Johann Baard also featured on one of the panel discussions that took place at the business seminars, which formed part of the event. 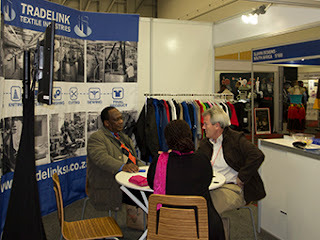 Other local businesses such as Tradelink Textile Industries were also among the exhibitors looking to reach the wider African market. Tradelink Textile Industries’ cotton products are all produced in George and are assembled in Lesotho, says Veronique McClenaghan of Tradelink Industries. Tradelink Textile Industries had convenient seating where visitors could network with their reps.